At the turn of the 21st century, a collaboration between a Bell Labs statistician and an experimental sound artist resulted in a mesmerizing visualization of real-time data that resonates still, in equal parts for its conceptual strength, cohesive aesthetics, and technical brilliance. 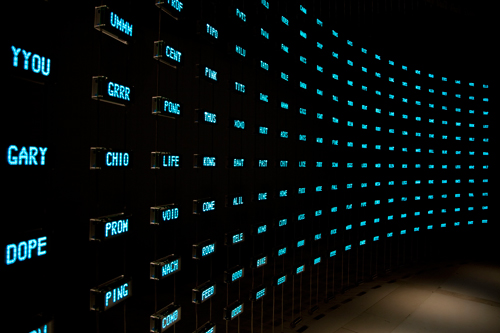 Beyond its far-reaching influence in new media art, and despite the ten years of rapid technological change that have passed since it was debuted, Mark Hansen and Ben Rubin’s installation Listening Post remains an outstanding engineering and aesthetic achievement in the realms of data visualization, internet-connected sculpture, and real-time data mining technology. NMEDIAC: The Journal of New Media and Culture is a peer-reviewed journal offering papers and audiovisual pieces which contextualize encoding/decoding environments and the discourses, ideologies, and human experiences/uses of new media apparatuses.